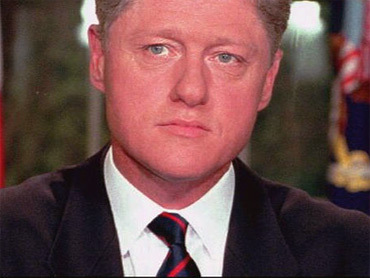 Bill Clinton on Lewinsky Affair: "I Cracked"
During a series of secret interviews in the White House with author and historian Taylor Branch, then-President Bill Clinton said his affair with Monika Lewinsky began because he "cracked" as a result of personal and political pressure. "I cracked; I just cracked," Clinton said, according to Branch, USA Today reports. The former president reportedly blamed the death of his mother, combined with the Democrats' losses in the 1994 midterm elections and the Whitewater investigation, for putting him in a state of mind that left him open to the affair. Branch has written a book based on the 79 interviews, the tapes of which he said Clinton kept in a sock drawer to keep them secret. Though the historian doesn't have access to those tapes, he would recap the interviews himself, on a fresh tape, following each visit he made to the White House. The USA Today story includes two other interesting revelations from Branch's book. One involves Clinton's recounting of an argument with his vice president, Al Gore, shortly after Gore was not elected president in 2000. Clinton said he had felt he wasn't used enough in the campaign, and told Gore he could have brought Gore victory had he been sent to campaign in New Hampshire or Arkansas. Gore responded that Clinton had been a "drag" on the ticket because of the affair, according to Branch's recollection of Mr. Clinton's comments. The pair then "exploded" at each other, blaming the other for the loss. Perhaps the most startling story in the article, however, involves then-Russian president Boris Yeltsin. Clinton told Branch that Yeltsin had been staying at the Blair House, the White House guest residence, in 1995 when the Secret Service found Yeltsin standing alone on Pennsylvania Avenue, wearing only his underwear, trying to get a cab. Yeltsin, slurring his words, told the Secret Service he wanted a pizza. The next night, Clinton reportedly told Branch, Yeltsin took back stairs to the basement of the Blair House, where a guard assumed he was an inebriated intruder. U.S. and Russian security forces soon arrived to assure the guard that the man in question was in fact the Russian president. Branch said Mr. Clinton is "nervous" about his decision to write the book. The two men were roommates in Austin, Texas in the early 1970s, when they were running George McGovern's presidential campaign in Texas. Branch said the two men had been talking about the book but that he did not make the changes the former president requested.